Public School System students who use eight bus stops on Saipan are in for a treat after the service organization Lion’s Club International in the CNMI adopted and repainted them. The organization, which consists of several smaller clubs in the CNMI, said Thursday that they adopted a total of eight bus stops on Saipan through the Saipan Fil-Am Lion’s Club, Saipan Unity Lion’s Club, Saipan Marianas Lion’s Club, and the Saipan Alliance Lion’s Club. The Saipan Fil-Am Lion’s Club adopted one bus stop near the Northern Marianas College going into the Finasisu Terraces and another on As Lito Road. 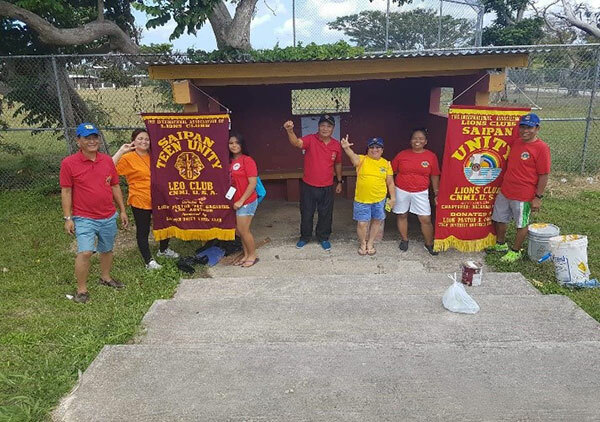 Saipan Unity Lion’s Club adopted one bus shelter in the Tanapag area and another near the Gold Beach Hotel on Beach Road. The latter, according to a statement from the organization, would be turned over to the Saipan Mayor’s Office. Both Lion’s clubs started their painting and rehabilitation of the bus shelters back in February 2016, the statement noted. The Saipan Marianas Lion’s Club adopted three bus stops—on Navy Hill, in Gualo Rai, and in Chalan Laulau. The bus shelters are still being repainted and repaired. This group started repairs and repainting in December 2015. The Saipan Alliance Lion’s Club adopted one bus shelter in the east Chalan Monsignor Martinez Road corner Afetna Drive in Koblerville. This group started repairs and repainting on June 2017. “After the typhoon, some bus shelters needed repairs, repainting, and cleanup of the surroundings. Once you adopt the bus shelters, primarily it’s your responsibility now to maintain the beautification of the area and the bus shelter itself,” said Lions Club Region 2 chair Annamae Adaza in a statement. One of the larger challenges for now, she said, include maintenance. Vandalism of the bus shelters are also problematic.